This publication presents a range of texts, studies, interviews and cultural examples of what we see happening in our cities and their wider regions across Europe: a powerful bottom-up movement led by citizens themselves, developing new participatory democratic practices that shape our cities and empower us to govern them in a different, collaborative way. Build the City: perspectives on commons and culture is a special collaboration between Krytyka Polityczna, the European Cultural Foundation and ECF Labs, with Subtopia (Sweden), Les Tetes de l’Art (France), Oberliht (Moldova), Culture2Commons (Croatia) and Platoniq (Spain), partners in our action-research network: Connected Action for the Commons. In 2018 werkte Antwerpen aan 't Woord (AaW) aan het project 'Iedereen Publiek?! ', waarbij AaW op onderzoek ging naar welke drempels mensen ervaren om aan cultuurbeleving te doen en hoe (socio)culturele organisaties daarmee kunnen omgaan. Het antwoord hierop kwam van de organisaties zelf, die heel wat inspirerende projecten ondernemen: van eenvoudig tot heel out of the box. Deze positieve projecten van collega's kunnen ook jou inspireren. Op welk project zijn ze trots? Wat heeft het tot een succes gemaakt? En zijn er dingen die ze een volgende keer anders zou aanpakken? Een boek vol inspirerende ideeën van collega's waarmee je meteen aan de slag kan.
governance existing between the community and other urban actors. It also underlines the necessity to go beyond actual conceptualisations of citizenship, always represented national vs urban, transnational vs national, or received vs achieved dichotomies. Using the qualitative methodology of semi-structured interviews, the analysis of Living Street in Ghent and Future Street in Antwerp underlines which conditions favour or hinder changes in urban governmental practices regarding the management of public spaces. The Co-Cities Open Book is the result of years of research and experimentations on the field to investigate new forms of collaborative city-making that are pushing urban areas towards new frontiers of participatory urban governance, inclusive economic growth and social innovation. This open book has roots in our conceptualization of the ‘City as a Commons,’ the emerging academic field of urban commons studies, and the work developed in 5 years of remarkable urban experimentations in Italy and around the world. Structured around three main pillars, the Co-Cities open book will first provide scholars, practitioners and policy-makers with an overview of the theory and methodology of the Co-City with the “Co-Cities Protocol”. The open book also presents the “Co-Cities report”, the results of an extensive research project in which we extracted from, and measured the existence of, Co-City design principles in a database of 400+ case studies in 130+ cities around the world. Ultimately, thanks to the Co-cities report we were able to create the first index able to measure how cities are implementing the right to the city through co-governance. Thus, the Co-Cities index serves as a fundamental tool for the international community in order to measure the implementation of some of the objectives that have been set by the New Urban Agenda and the Sustainable Development Goals. The last section of the book presents a collection, or annex, of articles of some of the most important researchers and practitioners studying the urban commons. These essays were conceived and offered as part of “The City as a Commons” conference, the first IASC (International Association for the Study of the Commons) conference on urban commons, co-chaired by Christian Iaione and Sheila Foster that took place in Bologna on November 6 and 7, 2015. 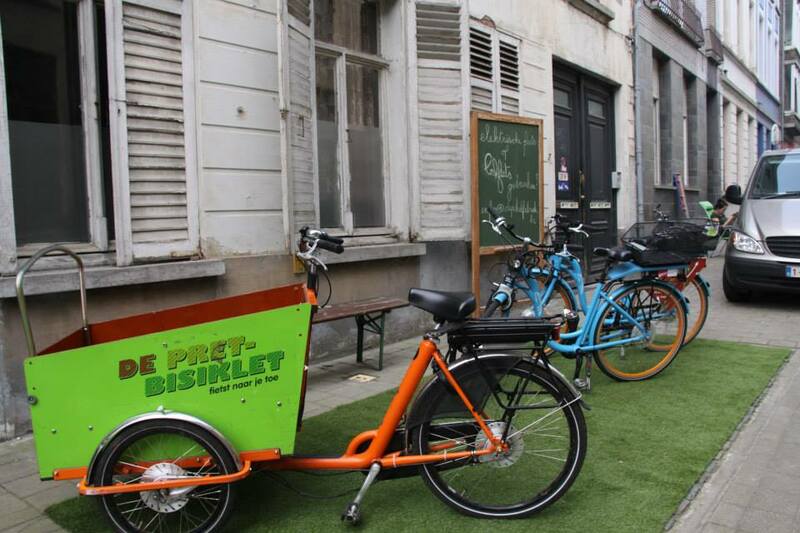 The Co-Cities Report benefited from a close collaboration with the P2P Foundation; the Transformative Actions Interdisciplinary Laboratory (TrailLab) of the Catholic University of Milan; and the International Association for the Study of the Commons (IASC). Michel Bauwens and Vasilis Niaros contributed to the data selection and collection during the exploratory phase (November 2015 through August 2016). An analysis on the findings from the first 30 relevant case studies provided by Michel Bauwens will be made available on the Co-Cities Open Book, forthcoming in its full version. Constant supervision and guidance for the theoretical framework and the methodological approach was provided by Sheila Foster and Leonardo Morlino. The contribution of LabGov research associates was precious and indispensable: Chiara De Angelis coordinated the data production team and provided support as lead research associate (2016/2018); Lucia Paz Errandonea and Cosima Malandrino provided critical support in data entry and graphic visualization during their curricular internship with the LabGov project (spring/summer 2017); Monica Bernardi provided support with data collection in Seoul and Boston. Under the supervision of Sheila Foster, the research associates from LabGov Georgetown Chrystie Swiney, Sumedha Jalote and Zezhou Cai contributed with data entry, data collection and detailed case studies’ analysis in US, India and China. Alessia Palladino, Chiara Prevete, Benedetta Gillio, Anna Berti Suman, Sofia Croso Mazzuco contributed to the data entry and data collection process. A valuable support was provided by students from the course “Urban Law and Policy” at LUISS Guido Carli University, academic year 2017/2018 and 2018/2019 who contributed to the Co-Cities research with data entry, data collection and case studies analysis in different geographical areas. Urban gardening has become a growing international movement. Many urban gardens are established, organized, and managed collectively as commons. Particularly in developed countries, these community gardens (a subset of urban gardens) emerge not only in response to a lack of locally produced food, but also in response to a lack of democratic use of public spaces or missing opportunities and time for socializing. They then give rise to social networks that fulfil various social functions. Although community gardens are often listed as examples of commons, they have thus far lacked closer scientific examination. Hence, we present criteria to explore and categorize community gardens as commons by their degree of collectivity. This is based on five components: resource system, infrastructure, resource units, work, social time. We classify these criteria further according to various styles of use, ranging from individual use to sharing. To demonstrate the utility of this model we implement a quantitative study of community gardens located in one of the most urbanized area in Germany, the Rhine-Ruhr Agglomeration. Our results show a high diversity of collective use and the importance of sharing immaterial components in sustaining community gardens, notably social values. We can empirically demonstrate that gardeners develop diverse ways of collective action and social interaction to manage and change their urban environment. To aid in thinking about these issues, we provide an initial typology of community gardens according to their relative degrees of collectivity, reflecting the underlying values of these alternative agricultural system. Translab staat voor Transitielaboratorium. Het is een plaats waar mensen die transitie belangrijk vinden inspiratie opdoen, elkaar ontmoeten en ervaringen delen over de transitieprojecten waarmee ze experimenteren. Zo wordt de transitiebeweging sterker. Op zondagvoormiddag 9 december 2018 was er een Translab in Sint-Niklaas. Commons Lab was te gast om een lezing te geven: 10 tips om van gemeenten opnieuw gemeengoed te maken. This article explores the relevance of combining multiple understandings of democratic politics to analyse the ambivalent and contentious dynamics of citizen participation in spatial planning. Building forth on the ongoing efforts in critical planning theory to overcome the deadlock between collaborative and agonistic oriented planning approaches, we argue for the refraining from ‘over-ontologising’ the question of democratic politics in planning processes, and start from the assumption that participatory planning processes as an empirical reality can accommodate radically different, even incompatible views on democracy. In addition, it is argued that while current planning scholars predominantly focus on the applicability of the collaborative and (ant)agonistic approach to democratic politics, a third approach – based on Jacques Rancière’s notion of political subjectification grounded in equality – may be discerned. By mobilising an empirical study of a contentious participatory planning initiative in Ghent (Belgium), that is, the Living Street experiment, we illustrate that while different approaches to democratic politics do not necessarily align with each other, they are often simultaneously at work in concrete participatory planning processes and indeed explain their contentious nature. Het betonnen bos ‘Antwerpen’ is langzaam aan het ‘vergroenen’. Heel veel Antwerpenaren komen met heel uiteenlopende ondergrondse, kleinschalige, innovatieve, collectieve vergroeningsinitiatieven. Speelplaatsen van scholen worden opgebroken en vergroend. 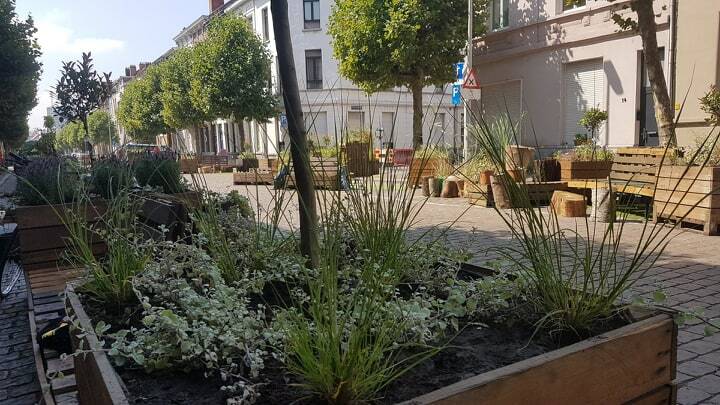 Overal in de stad zijn Antwerpenaren bezig met gemeenschapstuinen, geveltuinacties, groendaken, boerenmarkten, buurderijen, boomspiegels, gevelregentonnen, groenslingers,… Ons stadsleven wordt natuurlijker, avontuurlijker en gezonder. Antwerpen evolueert naar een Tuinstad en alle Antwerpenaren worden tuinmannen en tuinvrouwen. Tijdens BOTANIK #3 City Wildlife (zaterdag 5 mei, de Singel) organiseerden we voor het eerst in Antwerpen een interactieve ‘Commons assembly’. Een soort Staten-generaal waar initiatiefrijke Antwerpenaren verzamelen. Burgers, ondernemers, ambtenaren, politici, activisten, studenten, … kwamen een ganse dag samen om elkaar te ontmoeten, te inspireren, te discussiëren, samen plannen te smeden om Antwerpen structureel te gaan vergroenen. •Er is heel veel onderbenut potentieel bij de Antwerpenaar. Heel veel Antwerpenaren zijn bereid om bij te dragen aan een groenere stad. Individueel (bvb. gevelgroen) en collectief (bvb. een 'Tuinstraat'). Maar nog heel weinig Antwerpenaren zijn vertrouwd met collectief groenbeheer. Ze beschikken nog over beperkte expertise, maar ook over beperkte tools en ruimte om te oefenen. •Er is de laatste jaren enorm veel groeninitiatief in Antwerpen. Maar het initiatief is versnipperd, komt vanuit heel diverse hoeken: burgers, middenveld, diverse overheden, ondernemers, kennisinstellingen, … Er is een beperkte cultuur in Antwerpen om kennis, ervaring, netwerken, (financiële middelen),… mbt vergroening te delen. •Er is in Antwerpen geen gemeenschappelijke visie en actie mbt ‘Antwerpen Tuinstad’ . De dialoog tussen actoren en stakeholders, is beperkt, er is beperkte interactie tussen informele en formele beleidsprocessen. •Vergroenen van Antwerpen als strategie voor inclusie, sociale innovatie, ontwikkeling lokale economie, duurzame stadslandbouw en tewerkstelling is nog onontgonnen. •In de praktijk zien we dat de stedelijke diensten steeds minder capaciteit en/of middelen hebben om de stad verder te vergroenen. Er zijn in Antwerpen bijzonder leerrijke en diverse commonsgerichte vergroeningsinitiatieven. Ze leren ons dat o.a. de schaal, de aard van de vergroening en de capaciteiten van de beheerders enorm belangrijk zijn mbt collectief beheer. We trachten fietslussen te organiseren en initiatieven te bloggen zodat kennis, ervaring, … laagdrempelig gedeeld kan worden. Je hebt als commoner weinig hefbomen om mensen en organisaties te stimuleren om samen te werken. Je kan dit als commoner ook positief benaderen; het geeft ruimte om te claimen als commons (letterlijk en figuurlijk). Er is wel grote bereidheid bij Velt en Natuurpunt om groeninitiatieven te ondersteunen. Er is in Antwerpen weinig verbinding/interactie tussen de informele en de representatieve/formele (ADOMA, Groenplan, s-RSA, klimaatplan, waterplan, politieke partijen, …). We adviseren commoners om zoveel mogelijk informeel contact te nemen met de administratie, om dialoog en samenwerking te bewerkstelligen. Er zijn in Antwerpen nog maar weinig groene ondernemers (‘generatieve economie’), met een duurzaam verdienmodel. We adviseren aan jonge, groene ondernemers om zoveel mogelijk met elkaar in dialoog te gaan, samen te werken, middelen te delen. We ontwikkelden een nieuw soort buurtcontract mbt het collectief beheer van groen in de stad. We ontwikkelden een nieuw soort groenstedelijk netwerk: burger(collectief)/middenveld-stad-ondernemers. We bekijken met o.a. het Ecohuis of en hoe we dat in Antwerpen verder gaan organiseren cf ‘Gent en garde’. Een initiatief van Commons Lab Antwerpen met de steun van BOTANIK, Burgerbegroting district Antwerpen, de Singel, Ecohuis, Tuin in de stad, jeugddienst stad Antwerpen, Stadsmakers, Ecohuis, Velt vzw, Natuurpunt Antwerpen stad, Beweging.net, Posthof Berchem vzw, BIVAK, Stadslab 2050 en vele partners. Commons Network released the latest publication called ‘Urban Commons Shared Spaces’. The paper is a research project and report, based on 2 years of research in the cities of Berlin and Amsterdam. The paper was co-created with our friends at raumlaborberlin. 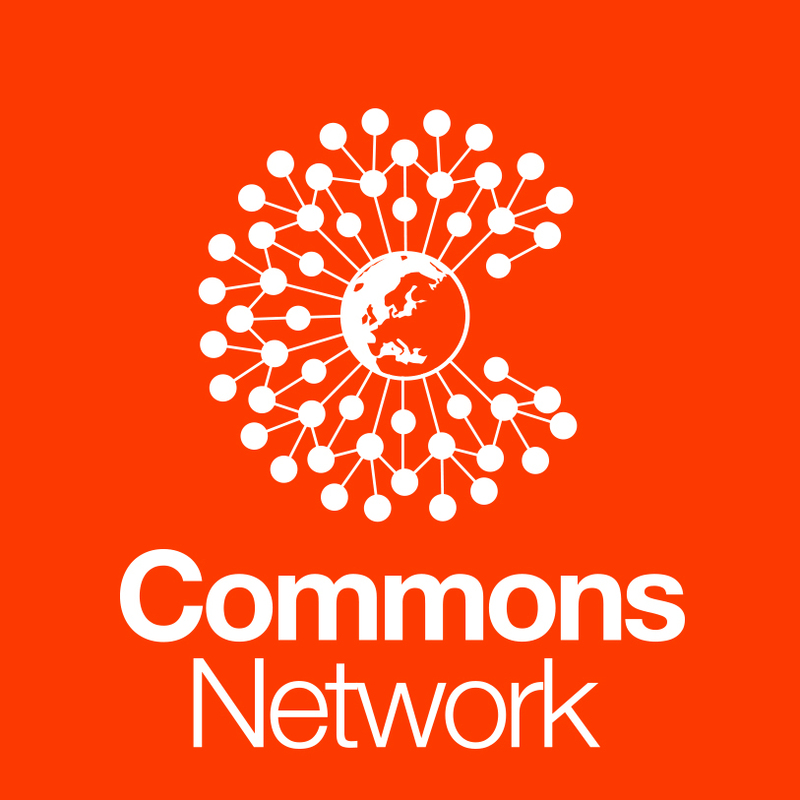 We believe we need to actively protect and strengthen commons initiatives in European cities and build and promote a commons sector by transforming cities’ institutional and policy frameworks. Commons in the city involve people managing urban resources – such as space – together through which economic and, more importantly, social value is created. It is crucial to protect that value as it sustains the very social fabric of our cities. Urban commons strengthen existing communities and bring people together into new ones, they herald the era of pro-active citizenship and encourage participatory and democratic governance. This paper is meant as an inspiration and tool for those involved or interested in the commons movement, as an urgent reminder for policymakers, as an invitation for politicians to think more concretely about the commons sector in their cities, and as the starting point for a constructive discussion about improving our cities by protecting and strengthening the commons in the urban environment. You can read it in full, embedded below, or download the pdf here. Koen Wynants werd door de Cultuurraad van de Kempen gevraagd om zijn kennis en ervaring te komen delen mbt burgerparticipatie. Als vereniging hechten ze veel belang aan de nauwe samenwerkingsverbanden met hun eigen gemeentes. Nieuwe trends kunnen een ander beeld werpen over de manier hoe we actief kunnen bijdragen om noden en wensen van de gemeenschap weg te werken. Koen Wynants geeft in de presentatie een overzicht van 15 jaar burgerparticipatie. Hij, zelf afkomstig van de Kempen, begon eind 2003 in opdracht van de Vlaamse Overheid in de Kempen te werken (‘Lokaal Gezondheidsoverleg Kempen’) als een soort ‘boundary worker’. Onder andere rond de zware metalenproblematiek, een zeer complexe, historische/actuele, milieugezondheidsproblematiek. Hij heeft daar geleerd waarom dialoog en samenwerking tussen heel verschillende actoren een absolute noodzaak is, hoe iedereen kan bijdragen aan de oplossing van een probleem. Ondertussen verhuisd naar Antwerpen, begon hij zich daar ook als burger te engageren, vooral via Antwerpen aan’t woord. Hoe kunnen we dialoog, samenwerking overal cultiveren? Wat kunnen stad en platteland van elkaar leren? Er zijn veel verschillen, maar zo bleek in de discussie achteraf, ook veel ‘common ground’. Een verhaal waar we hopelijk samen verder aan blijven schrijven…. De volledige presentatie duurt ongeveer 1 uur. Slides kunnen gedownload worden via https://www.dropbox.com/s/l9x7g7m8vf8b87d/Nieuwe%20trends%20burgerparticipatie%20%2024112018.pdf?dl=0 Gebruiken en ons uitnodigen mag, maar wel onder onze voorwaarden, ‘als creative commons’. Om antwoorden te zoeken op actuele maatschappelijke uitdagingen nemen burgers steeds vaker het heft in handen en dit onder meer in de vorm van burgercollectieven die zelf goederen of diensten produceren, meestal vanuit een streven naar een duurzamer alternatief. Met steun van de Koning Boudewijnstichting en in het kader van haar Observatorium van Verenigingen en Stichtingen verrichte Oikos denktank het eerste onderzoek naar deze collectieven in heel het land: wie trekt ze, hoe belangrijk zijn ze en hoe positioneren ze zich tussen andere maatschappelijke spelers zoals klassieke middenveldactoren, overheden en bedrijven? Met een deskstudie, een enquête en diepte-interviews bracht Oikos burgercollectieven opgericht in 2015 en 2016 in kaart. Grond wordt al eeuwen geprivatiseerd, verkaveld en vermarkt. 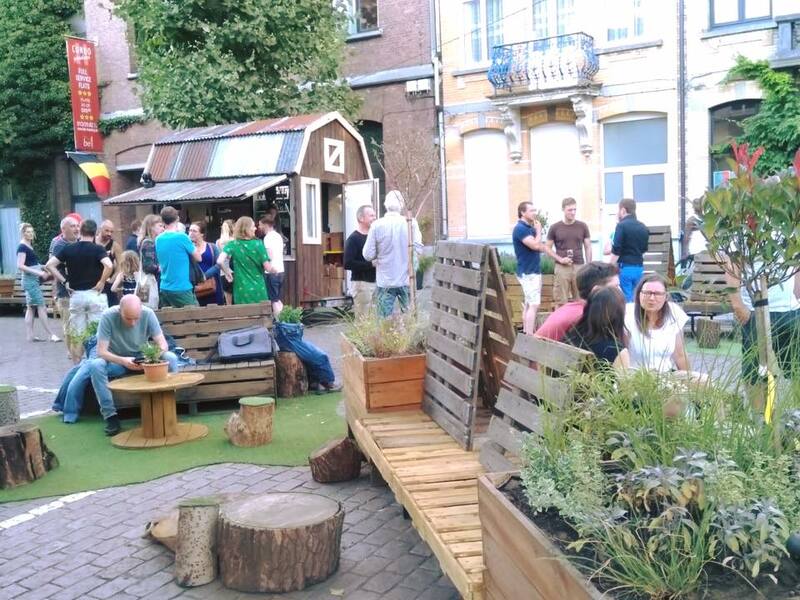 Commons bieden een alternatief: burgers halen grond uit de logica van de markt en brengen hem in gemeenschappelijk beheer. Op die basis organiseren ze dan bijvoorbeeld betaalbaar wonen, voedselproductie of trage wegen. 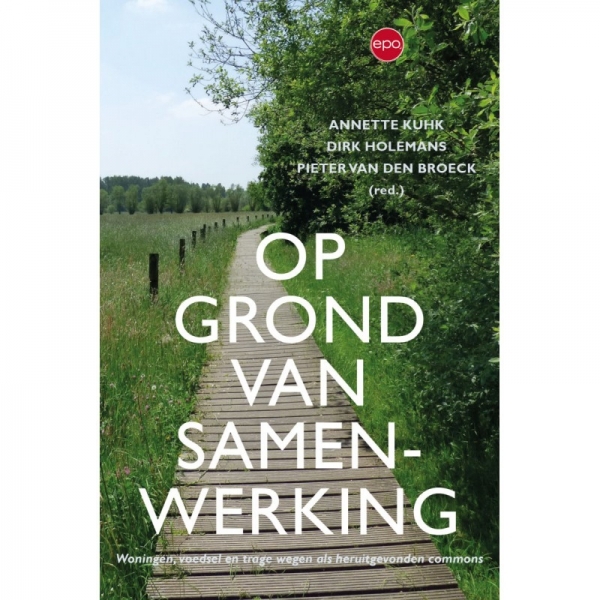 Het boek "Op grond van samenwerking" (A. Kuhk, D. Holemans en P. Van den Broeck, red., EPO 2018) is het resultaat van het INDIGO- onderzoeksproject naar grondgebonden commons in Vlaanderen. Het reikt daarvoor een theoretisch kader aan en presenteert ook enkele concrete voorbeelden. Ontdek nieuwe praktijkvoorbeelden van wonen, voeding & trage wegen en kom meer te weten over juridische instrumenten en uitdagingen. Bestel hier de nieuwe publicatie. A half day workshop including a bike tour through the city of Antwerp with Koen Wynants, commoner, founder of Commons Lab Antwerp, Stijn Wens (Antwerpenize), Sarah Goossens (Fundament). and Bram Stessel (PAKT). Koen explained the ‘City as commons’ paradigm and provide an overview of local Commons initiatives currently transforming the social, economic, political and technological urban landscape. The idea for this book came slowly following a gradual collection of blog posts on the CCRI website in recent years. 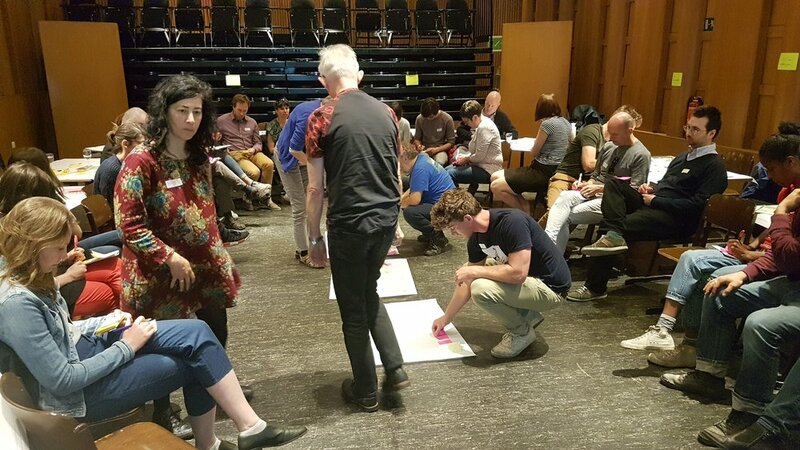 The posts centred around the general theme of how we manage shared assets and what alternative approaches there might be, informed by research and practice in the governance of commons resources. The whole area of commons and management of common pool resources has become more topical over the last 6 years following the award of the Nobel Prize for Economics to Elinor Ostrom, for her work on commons. Commons has long been an element of research within CCRI, particularly in relation to Common Land and Town and village Greens in England and Wales. Chris Short organised annual conferences on common land management from 1999-2010 which attracted over 1,500 delegates and sponsorship from the Countryside Agency, Defra, Natural England and the Countryside Council for Wales. This book is no more than a set of ‘musings’ or collected thoughts about a range of issues which we have addressed in our professional activities. It does not claim to address all aspects of an issue, or to present a balanced view of research findings. The aim is simply to present some of our ideas about management and governance of a range of resources that can be perceived in some way as ‘shared assets’. The resources addressed range from the local to the global, and encompass what have been termed traditional commons (such as fisheries, pasture, water) and ‘new’ commons such as the internet and urban areas. Our purpose in producing this book is to raise awareness of the principles of commons governance. Our aim is to encourage thinking about the ways in which application of these principles might open up alternative solutions to achieving long-term and sustainable management of the many assets that we share in common. This publication presents a set of very personal views on the IASC global conferences some IASC members have attended, often written while they were there. Everyone’s perceptions and experiences of these events is slightly different so these are intended only to provide an indication of the ambience and character of each conference. The book is not intended to be read from cover-to-cover, it is more a document for perusing, for dipping into now and again to get an idea of what it is like to be involved in one of these events as a participant, or as an organiser. 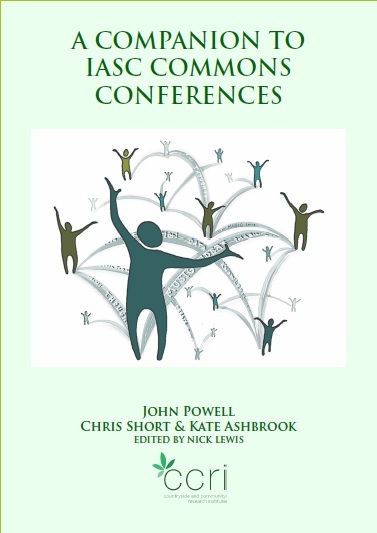 The authors have tried to capture and convey the spirit of the events they have attended, which are usually a mix of hard work, the enjoyment from meeting new people, and the excitement in gaining a little insight into how commons are managed in different parts of the world. White Paper "Collaboration in Cities: From Sharing to ‘Sharing Economy’"
The World Economic Forum’s Future of Urban Development and Services Initiative has released its new whitepaper on «Collaboration in Cities: From Sharing to ‘Sharing Economy’». The whitepaper, thanks to many contributors (among which also Sheila Foster), aims to improve understanding of the sharing economy’s potential by clarifying terminology; exploring examples of what kinds of goods and services can be shared, who participates in sharing platforms and why; and discussing the challenges created by the sharing economy and how authorities can respond. It takes stocks on the role of cities in integrating/implementing solutions for sharing of (or collaborating on) public assets and services and/or collaborating with other cities, enterprises (for-profit or not-for-profit) and other stakeholders to make the most of a city’s assets. It can be considered a first important step in systematizing all the experiences arising in the world about sharing economy and city government, from which go even further. Hoewel we de laatste jaren een lichte opmars zien van inspraak en participatie in steden en gemeenten, blijft die in veel gevallen echter wel nog beperkt of oppervlakkig. Nochtans zijn er tal van redenen om de burgers een prominentere rol toe te kennen in het bestuur van hun gemeente. Koen Wynants geeft in De Wakkere Burger/TerZake Magazine de toekomstige lokale besturen tien tips om hun gemeente veerkrachtig, inclusief, duurzaam en democratischer te maken. In een gezelschap van enthousiaste Gentse burgers zien in 2013 de eerste ‘leefstraten’ het levenslicht. Dit experiment, dat in straten ruimte schept voor groen en ontmoeting, stuurt aan op een radicale omwenteling. Een technische en rationele bestuurscultuur met betrekking tot straatinrichting kan plaats maken voor een systeem van co-creatie tussen stad, burgers en experts. Tegelijk wordt de dominante aanwezigheid van de auto bedwongen en de transitie naar een ecologisch duurzame toekomst gefaciliteerd. Kunnen leefstraten dit potentieel waarmaken en waar liggen de addertjes onder het (kunst)gras? (PDF) Addertjes onder het (kunst)gras. Available from: https://www.researchgate.net/publication/327071273_Addertjes_onder_het_kunstgras [accessed Aug 17 2018].